When I was in marching band, lo those many years ago, we had an instructor who would say, "If you can say it, you can play it." I'm of the opinion that the saying works just as well for knitting. Say it with me: block, blocking, blocked. See? Easy. I would by lying if I told you it was quick. It's a little tedious, but the payoff is there. See? 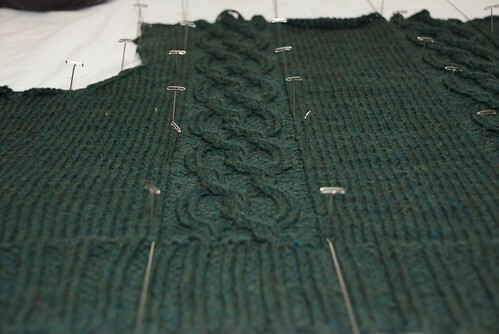 Meghan's Twist Cardigan, almost finished! I wove my dressing (or blocking) wires up both outside edges, then through every single stitch on both outside edges of the cables. (Precision work like this totally tickles my OCD, for the record.) This sweater has beautiful shaping, so blocking it square would be positively criminal. It's a runway of cable-y goodness. 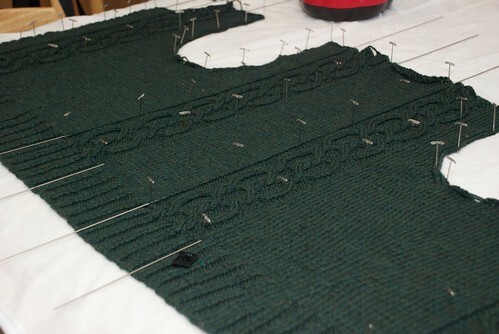 It took three episodes of Battlestar Galactica (two hours, fifteen minutes) to get it totally blocked- from setting up the Knitter's Blocks through steaming it. I know you're thinking "Two and a half hours? That's a lot of time." I love the effect of blocking. It really elevates the level of my work, and corrects a multitude of tiny inconsistencies. It also means spending some quality time with Steamy, and you know how I look forward to our encounters. And for those of you who use the all-too-common "It'll block out," this goes doubly for you. It can't block out if you don't do the blocking. I love the "finished" look that blocking gives, and don't consider most items completed until they have been thoroughly (and sometimes severely) blocked. I love the photography on this post too, and great tip on how to make the cables pop! It never, ever would have occured to me to run those wires up the cable pattern. Genius. Thanks for (yet another) lesson.